Over the last thirteen months I have worked on two parallel projects, Dead Reckoning and Refugees Crossing. For both I have made small paper boats and so far have produced over 13,000; endlessly marbling, drying, tearing and folding paper, then sending it out into the world as fragile reminders of people caught up in the refugee crisis. Making the boats became the focus of my work in April 2015, when in two separate incidents just six days apart,1200 people drowned in the Mediterranean Sea. Though I searched high and low, nowhere could I find their names, no tributes to their lives and achievements, just articles about numbers and talk of invasion. It troubled me that though each one of these people was loved, all somebody’s son, daughter, neighbour or friend, the media had reduced them to statistics and burden. Even more concerning, politicians both at home and abroad, increasingly used dehumanisng language when talking about what is essentially the biggest humanitarian crisis since the Second World War. For the past six years I have spent much of my time as an artist looking at the power of words to shape or change perception. Reading about the refugee crisis, I felt an overriding urge to find some way of respectfully marking the loss of these people’s lives, whilst at the same time challenging the myths surrounding migration. In 2015, each time someone drowned in the Mediterranean attempting to reach Europe, I made a boat as a dedication to his or her loss, labelled with a relationship to another person. The Missing Migrants Project (whose data I use) records a total of 3,770 migrant deaths in the Mediterranean in 2015 and a further 2,443 deaths by the end of May 2016. I shall continue to make boats and campaign for safe passage. Refugees Crossing is an interactive project, which has naturally flowed from Dead Reckoning. 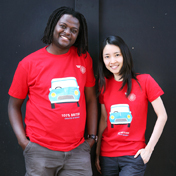 Through taking part, members of the public are invited to consider the welcome received by migrants and refugees. The project has in part been inspired by the use of graffiti to communicate censored information, as it can sometimes feel dangerous to challenge strangers directly on strongly held views. Refugees Crossing provides an opportunity to do this in a gentle, non-confrontational way. It is a means of countering myths surrounding migration and asylum in an increasingly hostile political environment, engaging members of the public to challenge fear and misinformation in their local area by discreetly placing small, fact-filled paper boats when travelling about their daily business. 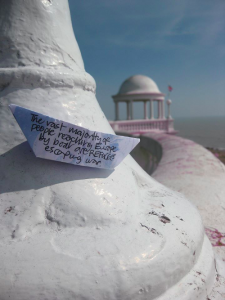 I make the boats which are then mailed in packs of 30 to members of the public wanting to support refugees and migrants. The boats are positioned in the streets, on buses, trains, planes, at stations, bus stops and crossings, photographed in situ and the image uploaded to social media as well as a designated Facebook page, called Refugees Crossing. This encourages more factual debate about the issues around migration. 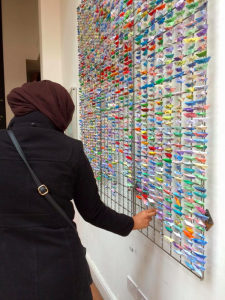 Since September 2015, 7000 boats have been placed in over 100 towns and cities in the UK, USA, France, Cyprus, Germany, Spain, Italy, Portugal, Hungary, Russia, Goa, and Greece, translated into five languages and used in schools universities and colleges to teach about migration. 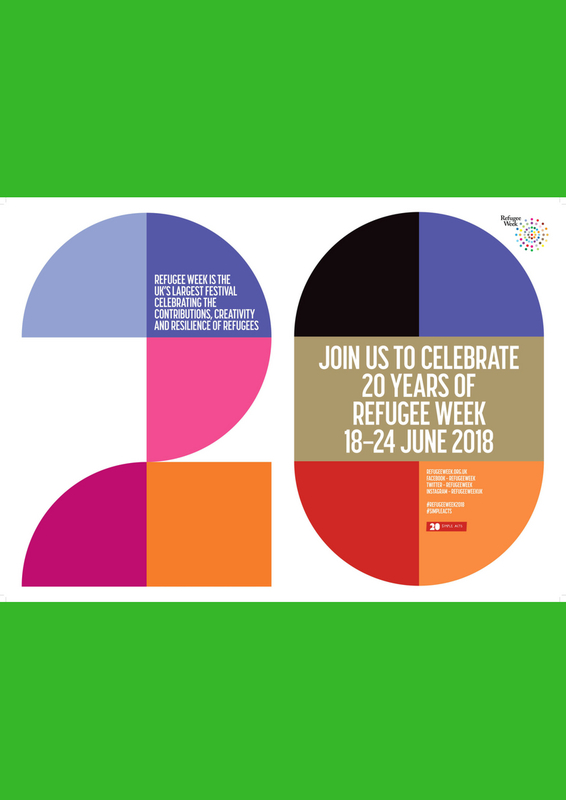 This June I’m delighted to be taking part in Moving Stories, the Refugee Week Special at the British Museum. In collaboration with Vietnamese artist and former refugee Hong Dam, I shall be making an installation exploring the journey of the refugee as seen from the perspectives of two artists with very different life experiences.